Be The Difference Foundation is proud to announce its first endowment fund. The fund was made possible through the generosity of Judy Rome and the Jay Horowitz Family. The fund was announced at the Honoring and Remembering Event presented by Be the Difference Foundation on Thursday, September 20, 2018. Dallas, TX, September 25, 2018 --(PR.com)-- Be The Difference Foundation is proud to announce its first endowment fund. The fund was made possible through the generosity of Judy Rome and the Jay Horowitz Family. 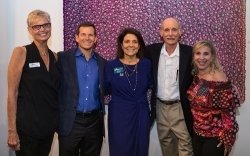 The fund was announced at the Honoring and Remembering Event presented by Be the Difference Foundation on Thursday, September 20, 2018. One woman is diagnosed with ovarian cancer every 24 minutes. One woman dies from ovarian cancer every 37 minutes. 70% of women diagnosed will die from the disease. Sadly, there is no routine, reliable early detection test available for ovarian cancer today. Funds raised through Be The Difference Foundation benefit organizations working to end ovarian cancer and support women currently battling the disease. Beneficiary organizations include: The Clearity Foundation, Mary Crowley Cancer Research, MD Anderson Cancer Center, UT Southwestern Medical Center, NYU Langone Medical Center-Perlmutter Cancer Center and The Lazarex Cancer Foundation.